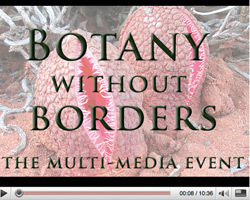 The response tothe 2009 "Botany without Borders" was so good, and turned out to be such an easy way to highlight the Botanical Sciences, that it has prompted us to add video clips from BSA members around the world to uour web site. We also use videos to share poster presentations and featured talks from our Botany Conferences each summer. Ask about sharing your favorite botanical video clip online through www.Botany.org- videos@botany.org! Enjoy! Amy Faivre - Plant Reproductive Biology of Chasmogamous and Cleistogamous Flowers of Federally Threatened Clitoria fragrans (Fabaceae) Along the Lake Wales Ridge in Florida. Emily Rollinson - The diversity of riparian plant communities of small woodland streams in northern New York State. Botany 2012 Abstract Bryan Thompson - Comparison of hydroponics to conventional agriculture: Analysis of overall yield, biomass and root growth of basil (Ocimum basilicum) and tomato (Solanum lycopersicum). Botany 2012 Abstract Charles Blair - Invasive Aquatic Weeds: Implications for Mosquito and Vector Management Activities. Karen Hall - Biocultural Connections through the Cherokee Worldview Garden. Botany 2012 Abstract Grant M. Barkley, Jennifer A. Fike - Origins of American Experimental Plant Physiology. Botany 2011 Abstract Charles Blair - Invasive Aquatic and Riparian Weeds and Mosquitoes; Challenges, Successes, and Oppoutunities. Botany 2011 Abstract Saul Hoyos - Anatomical and morphological characteristics among Fusispermum spp. and Rinorea apiculata group (Violaceae) can be useful for understanding the phylogenetic relationships. Botany 2011 Abstract Karar Butterworth - Showcase of Student PlantingScience Projects. Amanda Birmbaum - Volatile Oils of Monarda viridissima, an Endemic Species of the Carrizo Sand Formation in Texas. Shabnam Jabbari - Flower Color Variability and Mixed Mating in the Protandrous Herb Saponaria officinalis (L. Caryophyllaceae). Co-author: Sandra L. Davis Jonathon Jasinski - In Vitro Assessment of Allelopathy in the Invasive Aquatic Fern Salvinia molesta. Co-authors: Michael E. Kane and Ryan Dickson John Silvius & Daniel Thomas -An Integrative Approach to the Characterization of Psilotum (Psilotophyta): Insights from the Past and Recommendations for the Future. Pedro Escobar Garcias - Evolution and phylogeography of the Western Mediterranean Lavatera triloba aggregate (Malvaceae). Botany Without Borders We are pleased to present BSA President, Dr. Karl Niklas' inaugural address and gift to all plant societies, the multi-media event, "Botany without Borders." 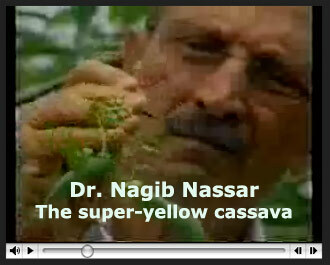 The short clip (10 minutes) outlines the importance of plants and those who study them. It explores the magic and wonders plants represent and the people who unlock their secrets. If your internet connection is slow, let the entire program download before watching to get the full effect. Click on the arrow and enjoy! Botany 2009 Abstract John Pascarella - Evidence of Hybridization between a federally endangered plant, Baptisia arachnifera (Fabaceae), and a native congener (Baptisia lecontei) at an ex situ conservation planting. Hosted by Dr. Chris Martine of Bucknell University, with guest experts Drs. Bill Rember and Dave Tank of the University of Idaho. Hosted by Dr. Chris Martine of Bucknell University, with guest expert Dr. Rachel Schultz of the SUNY Plattsburgh. Plants Are Cool, Too! Episode 4: Desert Blooms and Marathon Moths! Hosted by Dr. Chris Martine of Bucknell University, with guest expert Dr. Krissa Skogen of the Chicago Botanic Garden.